The finish line for Race 7: The Forever Tropical Paradise Race to Sanya is just days away and some last-minute tactics are being deployed to keep Race Viewers sweating on who is going to win. Race leader Qingdao, which is aiming for its first win of the 2017-18 race, opted to go into Stealth Mode yesterday and is now hiding its position and route from the rest of the fleet as it heads to the finish. Skipper Chris Kobusch explained: “Just over 400nm to go and we went into Stealth Mode. We thought we might just as well play it now or lose it once we are within 250nm range of Sanya. At 1159 UTC (midday today) Qingdao will reappear and only time will tell if it has managed to maintain its position. Until then, PSP Logistics currently tops the leaderboard, holding a significant lead over Sanya Serenity Coast, currently second with Dare To Lead third. It has been a successful day for those further down the fleet with the results of the Elliot Brown Ocean Sprint confirmed. Nasdaq claimed the win with the fastest elapsed time, its first success in the Ocean Sprint, adding another three bonus points to the scoring gate point earned earlier in the race. Congratulations also go to GREAT Britain in second and Unicef in third, for the hard-earned bonus points. With the conclusion of the Elliot Brown Ocean Sprint, the whole Clipper Race fleet has its sights firmly set on the finish line despite the fading north easterly winds, progress towards the Sanya finish line remains good. 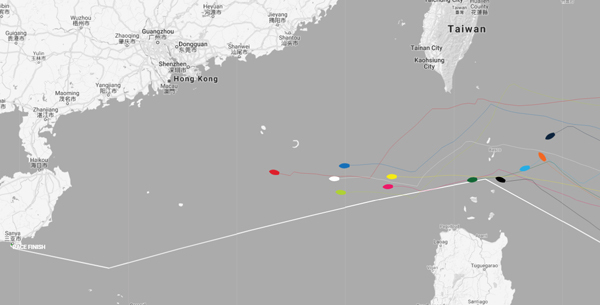 The battle for a podium finish is heating up between Sanya Serenity Coast and Dare To Lead. With less than a nautical mile between them and positions switching since yesterday, it is going to be a tense finish. With such close racing route planning to the finish is key. With the wind almost directly behind the yachts preventing them from sailing straight to Sanya, choosing when and which gybe angle to choose could be the difference between claiming a podium finish or not. Add to that a very busy stretch of sea for shipping, and it’s not going to be an easy final stretch. Unicef remains in the mix, close on the stern of Dare To Lead in fourth, and Liverpool 2018 is not far off the pace in fifth. Reappearing from Stealth Mode at 0559 UTC this morning, Garmin held its position behind Visit Seattle and ahead of Nasdaq, currently seventh on the leaderboard. For Nasdaq [eighth], HotelPlanner.com [Stealth Mode] and GREAT Britain [ninth] the Elliot Brown Ocean Sprint is now complete but despite the trial and tribulations their hard work paid off. Simon Rowell, Clipper Race Meteorologist reports that the monsoon winds the Clipper Race fleet is currently experiencing will become more shifty and patchy over the next 24 hours, filling back in again in 36-48 hours and then strengthening for the final push into Sanya. He adds that there is still fog along the north side of the South China Sea, but nothing too organised as far as squall activity goes. Keep up to date with how the latest weather conditions are affecting the fleet via the Clipper Race Viewer and hear more from the Skippers and crew on the Team Pages. Nominations for the Stormhoek Social Spirit Awards are now open, so please visit the Stormhoek Wines Facebook Page to say which Clipper Race team you feel has shown the most social spirit on this race and provide a reason why. Race 7: The Forever Tropical Paradise Race will finish in Sanya Serenity Marina in Sanya, and the latest Estimated Arrival Times can be found on the Clipper Race website. Crew are excited to explore Sanya and all it has to offer during the stopover, and you can find out more about the stopover schedule here.